Weaving the wreath is vintage fun. Associated with many traditions and folklore. Master the simple skill of weaving a wreath can and should everyone, especially the girl. It's so fun to decorate the head, or child "alive" rim while camping. 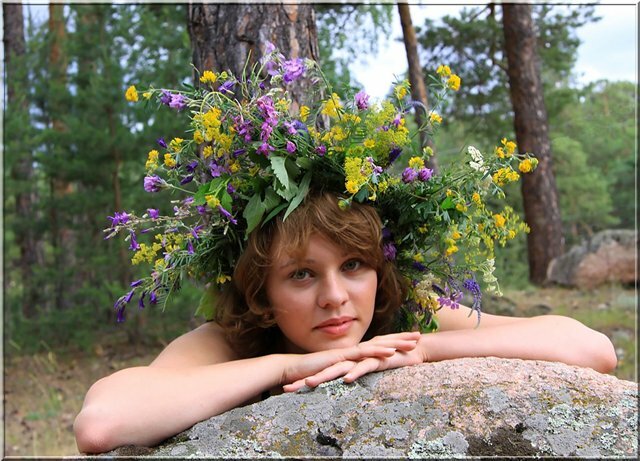 And it may be that you will make folk costumes for any occasion, and will crown your head with a crown of flowers. Plaiting a crown will require different flowers on long stems (at least 15-20 cm). The longer the stalk, the stronger will the wreath. Flowers you can use live or artificial. Use the flowers of one or more classes, you can also add the grass to make a wreath voluminous and interesting. You also need a thread or a long, thin grass. Prepared to disassemble the wreath of grass and flowers on the varieties and put them in a row, in the order in which you would like to see them in your wreath. Remove from the stems of extra leaves to the wreath base is not too thick and uneven. Begin braiding three or four plants. Pile them close, and weave into a braid. The scythe can be priplesti the entire length of the stems or make only 5-6 weaves, to bond them together. This "frame" wreath of flowers. Then start to drag to the basis of other flowers and herbs. Take the flower and attach it to the base with the outer side of. Place the stem from the bottom up, then right to left around the Bud (inflorescences). Grab the remaining length of the stem in one pile. The following plant plaiting the same way. It turns out that each subsequent plant attaches to the base of the previous one. When you weave a wreath of sufficient length, braid not braided the ends of the stalks. Connect the first and the last flowers, the folding of the wreath circle, and then a long blade of grass (or thread) fix the wreath, gently optiva it in a spiral around the entire circumference. And so until then, until all the ends of the stalks to blow over smoothly.